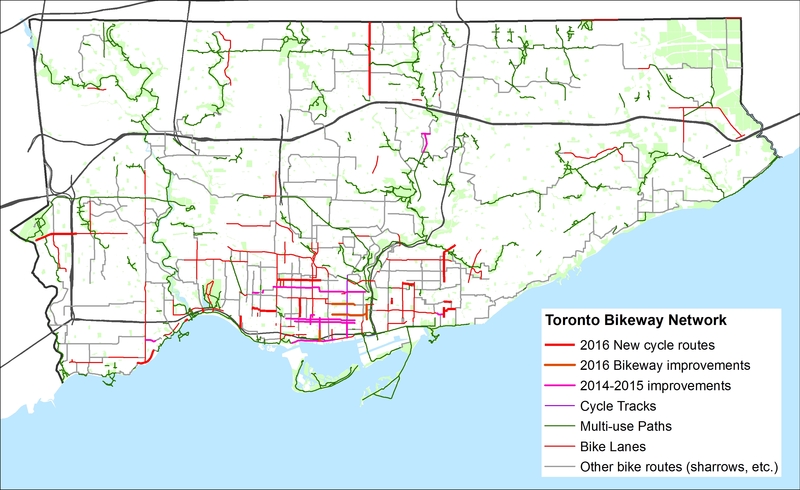 In Torontoist last week, I mapped the new and improved bike lanes proposed for 2016. 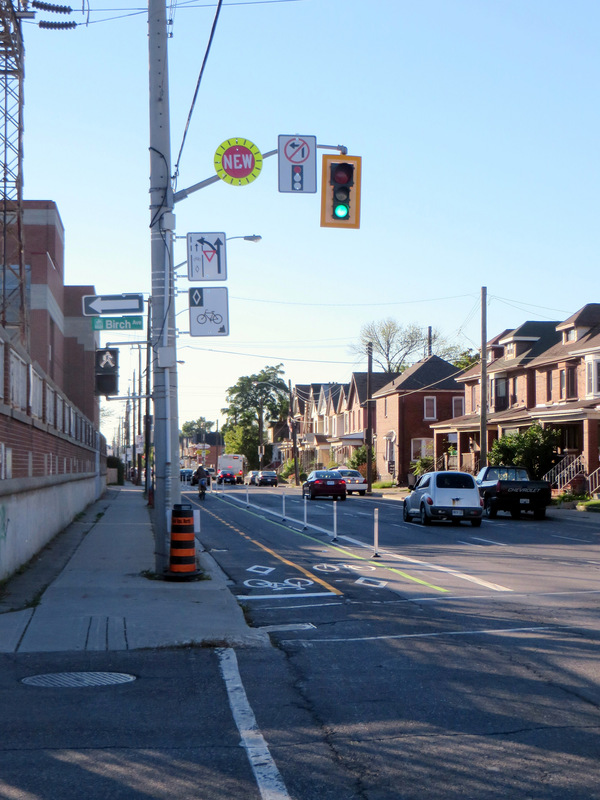 There are some great new additions – more contraflow lanes in the east end and through Kensington Market allow cyclists to take direct routes along quieter residential streets. There will finally be a pilot of the long-demanded Bloor Street bikeway; at least between Shaw Street and Avenue Road. And, as I write this post, work is being completed on separated bike lanes along Adelaide and Richmond Streets east to Parliament Street. The popularity of the lanes added last year (University Avenue to Bathurst) pretty much guarantees that these new bike corridors, still officially pilots, are permanent. But the map below – created for the Torontoist post – shows many gaps, even with the new 2015 and 2016 additions. Note the long north-south lane in the top centre of the map. That’s Willowdale Avenue, the longest planned addition. It ends at Sheppard, just before Highway 401; there’s no easy and safe way for cyclists to cross North America’s widest and busiest auto route anywhere near where the new Willowdale bike lane ends. Freeways and railways remain nearly impenetrable barriers for pedestrians and cyclists; this prevents the true implementation of a minimum grid. But even bike lanes are only good if they aren’t blocked by ignorant or ill-intended motorists. Simple barriers like knock-down bollards or curbs are helpful, but they aren’t always effective. Last Sunday, I cycled from my home in east Downtown Toronto to Downtown Hamilton, following the Martin Goodman Trail, Lakeshore Road, and the Hamilton Beach trail for an 84-kilometre ride. Through Oakville and Burlington, the Waterfront Trail is nearly non-existent, so I ride on Lakeshore Road itself, which has bike lanes in only a few sections. But motorists are, almost without exception, courteous and patient; it’s the one place in the suburbs where I really enjoy cycling. In Hamilton, after crossing the Queen Elizabeth Way on a spectacular bridge that also spans the Red Hill Creek, I again take minor streets to make my way west towards downtown, where I usually visit a favourite pub on Augusta Street before loading my bike on a GO Transit bus rack and returning to Toronto. Hamilton, like Toronto, has started to add some great new cycling infrastructure. 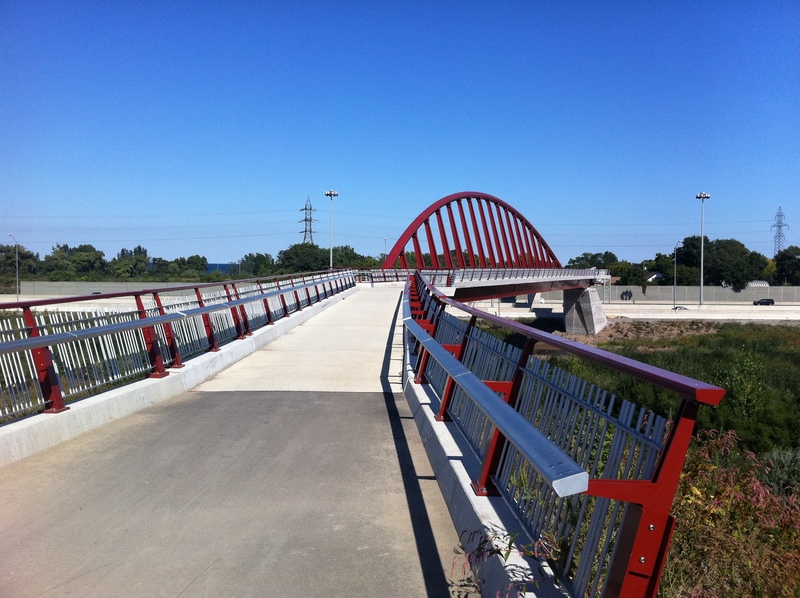 It has a bike share program, called SoBi Hamilton, it has great trails leading out to Brantford and Caledonia (as well as the Waterfront Trail), and some new bike lanes and cycletracks. The most impressive is Cannon Street, where a lane on a one-way arterial was transformed into a two-way separated cycletrack last year. @Sean_YYZ How do you expect people to accept deliveries or move house? You're being ridiculous. This isn't an issue. @Sean_YYZ There's enough room on the sidewalk to navigate around. This is a non-issue. Sidewalk riding is itself illegal and dangerous (sidewalk riding cyclists are a pet peeve of mine). Happily, there were plenty of others willing to correct that user about the safety of vulnerable road users and the various laws and by-laws applicable in this case. But this is all a long and winding way to say that more cycling infrastructure is great. And places like Toronto and Hamilton are doing great work on that front. But the infrastructure is only as strong as its connectivity, and as long as they’re not blocked by ignorant and/or hostile motorists. Education and enforcement need to go along with the buckets of green paint, signage, and barriers now being added in our cities. 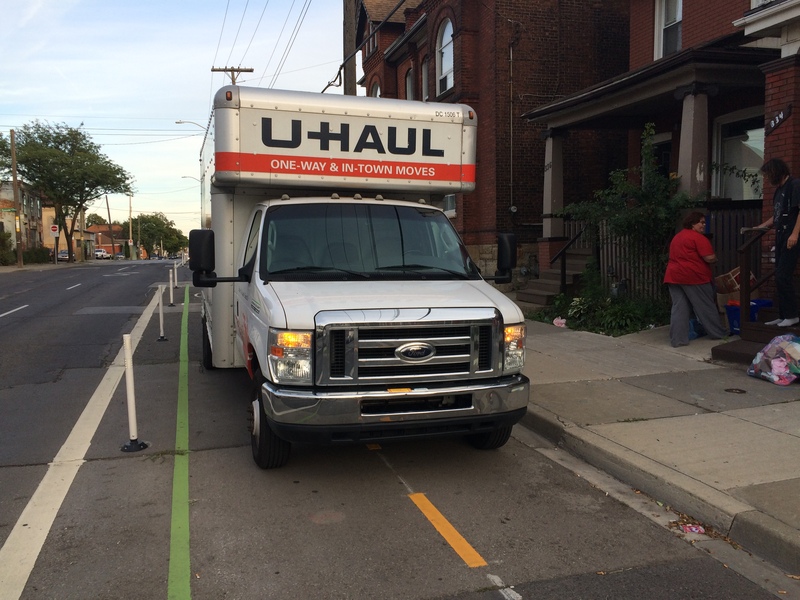 This entry was posted in Cycling, Toronto and tagged Cycling, Hamilton, Toronto, Torontoist. Bookmark the permalink.